This Autumn is very rich on video slots. NetEnt Company announced about new dizzy video slot. “Finn and the Swirly Spin” sees the light in the end of November. Rejoice NetEnt Company’s fans. NetEnt developers decided to make this October unforgettable with new “Planet of the Apes” video slot. It’s been several years since NetEnt has launched the “Blood Suckers” slot, but it still takes the lead position among online slots. 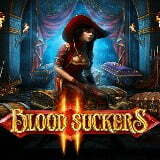 But NetEnt company did not stop there and will release the continuation of the legendary slot machine “Blood Suckers 2”.